Immunoprecipitation of Jurkat cell lysates, untreated or treated with Calyculin A, using Phospho-Akt Substrate (RXXS*/T*) (110B7E) Rabbit mAb (Magnetic Bead Conjugate) (lane 1 and 2) and Rabbit (DA1E) mAb IgG XP® Isotype Control (Magnetic Bead Conjugate) #8726 (lane 3 and 4). 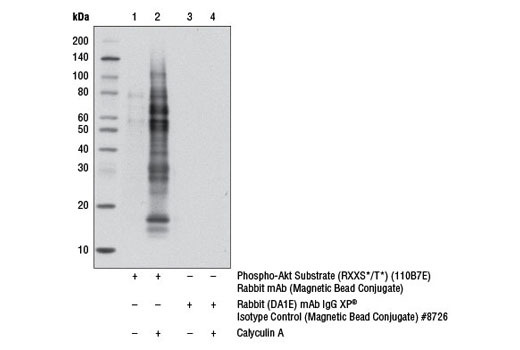 The western blot was probed using Phospho-Akt Substrate (RXXS*/T*) (110B7E) Rabbit mAb (HRP Conjugate) #6950. 6-Tube Magnetic Separation Rack: (#7017). Take 200 μl cell lysate and add 10 µl of the immobilized antibody, incubate with rotation overnight at 4°C. Wash pellet by using magnetic rack to pellet beads, then discard supernatant once completely clear and add 500 µl of 1X cell lysis buffer, vortex to resuspend and wash the beads, repeat 4 more times for a total of 5 washes. Wash pellet by using magnetic rack to pellet beads, then discard supernatant once completely clear and add 500 Âµl of 1X kinase buffer, vortex to resuspend and wash the beads, repeat 1 more time for a total of 2 washes. Keep on ice during washes. This Cell Signaling Technology antibody is immobilized by the covalent reaction of formylbenzamide-modified antibody with hydrazide-activated magnetic bead. Phospho-Akt Substrate (RXXS*/T*) (110B7E) Rabbit mAb (Magnetic Bead Conjugate) is useful for immunoprecipitation of phosphorylated Akt substrate proteins.